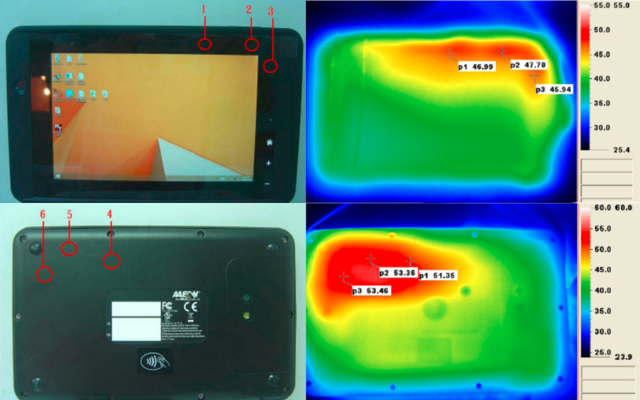 Designing and manufacturing a consumer tablet is something many manufacturers do well. They do not tend to focus on ruggedness rather than a stylish design with minimal “self-serviceability”. For manufacturers of industrial tablets, the focus is however to build a rugged tablet to meet the most rigorous environments with full-size I/O’s and “on-the-job serviceability”. Hard-knock life: The tablet must withstand vibration, knocks and drops. The universal standard is MIL-STD 810G (United States Military Standard), with the most popular method stating the device must withstand at least 26 drops of a height of 1.22 meters on each axis of the device. It furthermore must withstand strong vibrations comparable to a heavy-duty truck driving on bumpy dirt road. This means for example that the housing of the screw inserts needs to be reinforced and there should be an internal shock absorbing mechanism (such as brackets) next to the external ones (e.g. silicon rubber edges). 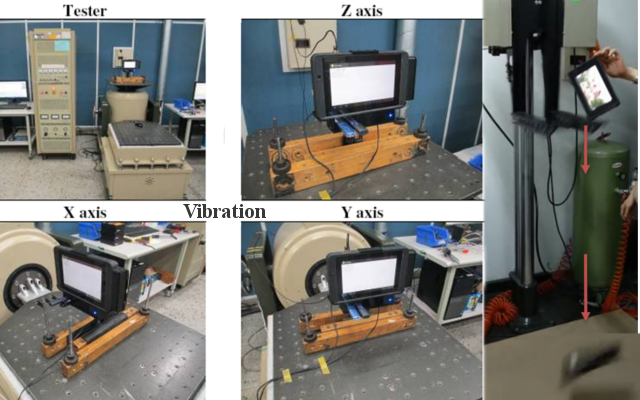 Test machines simulating these drops and vibrations can be found in figure 1. Protection: It needs to be protected against water and dust; mostly so-called IP65 rating is needed to meet most common industrial conditions. IP-rating stands for “International Protection Rating” or the level of “Ingress Protection” where the first number stands for the level of protection against small objects penetrating the device and the second number stands for protection against water. In our example, IP65 means it is fully dust-proof and water-proof from strong jets of water (up to 12.5 liter per min) on all sides of the device. 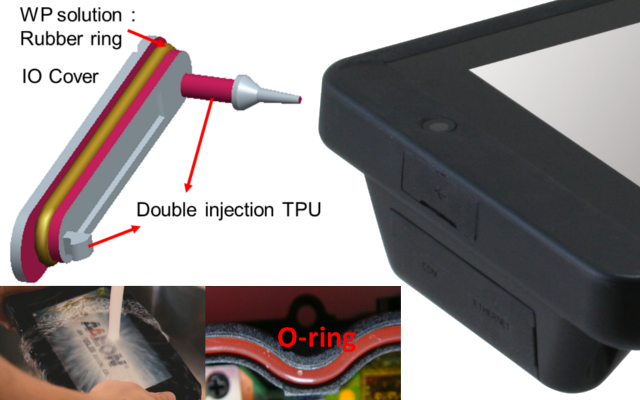 Seeing that professional users of these rugged tablets require full-sized I/O’s such as USB ports, COM ports and access to a hot-swappable battery, the real sealing challenge comes on these aspects as these interruptions in the housing material prove to be hard to seal properly. You can see in figure 3. what this might entail as to sealing precautions you will have to make.